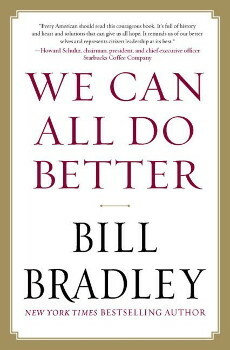 Excuse us for living, but “We Can All Do Better,” says Bill Bradley. It’s the title of his sixth book which hit the book stores this past May 2012. He uses a passage from Abraham Lincoln’s second State of the Union as his inspiration: “We can succeed only by concert. It is not ‘Can any of us imagine better?’ but ‘Can we all do better?’” Immediately, from Lincoln’s words inferring government solutions to our problems or just by mention of Bill Bradley’s name, a liberal Democrat, some people will dismiss the book out of hand. Yet, it is a worthy read in this presidential election season. 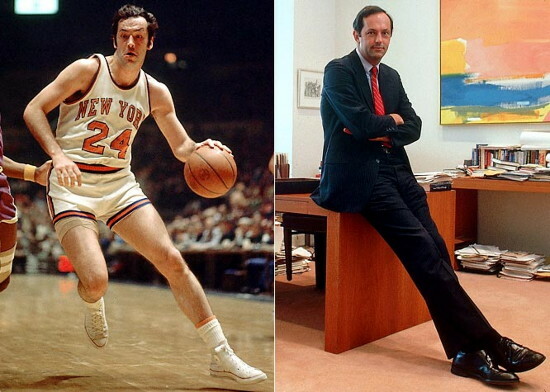 – -Plus, Bill Bradley is one of those people who, for many of us, transcends political party. The book features a number of policy prescriptions for our time to bounce around and enliven any discussion. And, Bradley has used interviews about his book to assure readers that, at age 69, this is not a campaign platform, saying he is not running for any political office. I had to refresh my memory that it was Bill Bradley who was Al Gore’s chief competition for the 2000 Democratic Party’s presidential nomination. But Bill Bradley’s three terms as U.S. Senator from New Jersey, 1979-1997, are still vivid memories. He made Denville his home, just “a hop, skip, and a jump,” one town away from our home in Montville. Bradley’s greatest contribution of those years was working with President Reagan and the Republicans to dramatically restructure/simplify the tax code. And hardly anyone, except the young, need be reminded of Bradley’s New York Knicks basketball fame from 1967 to 1977 with two NBA championships. He entered the Basketball Hall of Fame in 1982. And from his years earning a BA at Princeton, Bill was a basketball Olympic gold medalist 1964. He topped off his education with an MA from Oxford as a Rhodes Scholar. Tax labor less and things more: lower tax rates, remove loopholes, adopt a Value Added Tax, lower corporate tax rates to make the U.S. more competitive globally. Massive infrastructure investment: $1.2 trillion over 5 years, creating 5.5 million jobs per year in the process, and stimulating economic growth. Invest in R & D (Research & Development) and education: these are necessary so the American economy continues to lead and so American workers can compete globally. $50 billion over 2 years to subsidize 30% of new private sector hiring through tax breaks and incentives. Address the federal deficit: combine entitlement reform, spending cuts, and tax reform in one package, no loopholes/no earmarks/no gifts (and here he goes into the specifics as to how to proceed regarding what proportions re entitlements, spending cuts, & tax reform). Power to the People: Americans must participate in our democracy and counter the monied interests controlling the political process. He calls for a third political party to breathe health back into the system, not at the Presidential level, but at the Congressional level! Reverse the “Citizens United” Supreme Court decision: via a Constitutional Amendment to limit corporate spending on political campaigns. Interesting. Specific. Thought provoking. And whether we agree or not with former Senator Bradley’s recommendations, in the present political climate chances of most of his ideas being adopted are slim. Beyond his detailed prescription for our times, the overriding purpose of his book is to “restore hope,” to remind us that we have faced adversity in the past and, yet, “managed to pull through.” “So be optimistic…we’ll do it this time.” Bill Bradley’s We Can All Do Better is a call and challenge to all Americans to stand up, take action, and control our country’s destiny. Good synopsis, Phil. And it sounds like a book everyone on politics should be quizzed on next Friday! Thanks for the review for us! Phil, I agree wholeheartedly! I am so glad Jeff ordered up that party! Maybe another one in the fall? With Al Brown, Dave VanLeeuwen, Tedd Robb, etc. I know they’re out there!